167 Marlborough is located on the north side of Marlborough, between Dartmouth and Exeter, with 163 Marlborough to the east and 169 Marlborough to the west. 167 Marlborough was originally one of a pair of symmetrical houses (167-169 Marlborough) built in 1878, each three stories high (plus the basement level), with mansard roofs at the third floor, one story shorter than 171 Marlborough to the west. The two houses were designed by different architects and built by different builders, and over the years have been significantly altered. 169 Marlborough was remodeled first, in 1916, to remove the mansard roof on the third story, add a full fourth story, and add a partial fifth story at the rear. 167 Marlborough was remodeled in 1929 to expand the third story by eliminating the mansard roof and expanding an existing partial fourth story at the rear. It was further remodeled in 1980 to add a fourth story in the front and center of the house (connecting with the existing partial fourth story in the rear), with a new mansard roof in the front. 167 Marlborough was designed by architect J. Pickering Putnam and built in 1878 by Hezekiah McLaughlin, builder, as the home of Mary A. (Upham) Gordon, the widow of Dr. Charles Gordon, a physician. Prior to her husband’s death in March of 1872, they had lived at 109 Beacon. She subsequently lived at 71 Beacon and then 77 Beacon. She is shown as the owner of 167 Marlborough on the original building permit application, dated August 5, 1878. 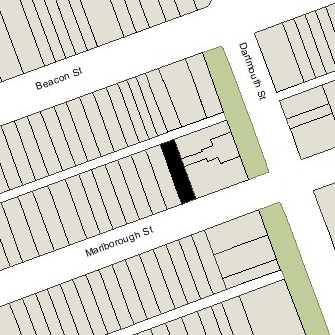 Mary Gordon purchased the 27 foot wide lot for 167 Marlborough on June 15, 1878, from Henry Lee. It was part of a 30 foot wide lot he had purchased from Eben D. Jordan on May 1, 1871, which, in turn, was the western portion of a 100 foot wide lot Eben D. Jordan had acquired from William Thomas on March 9, 1870. William Thomas had acquired the lot on November 2, 1869, from the Commonwealth of Massachusetts. Click here for an index to the deeds for 167 Marlborough. 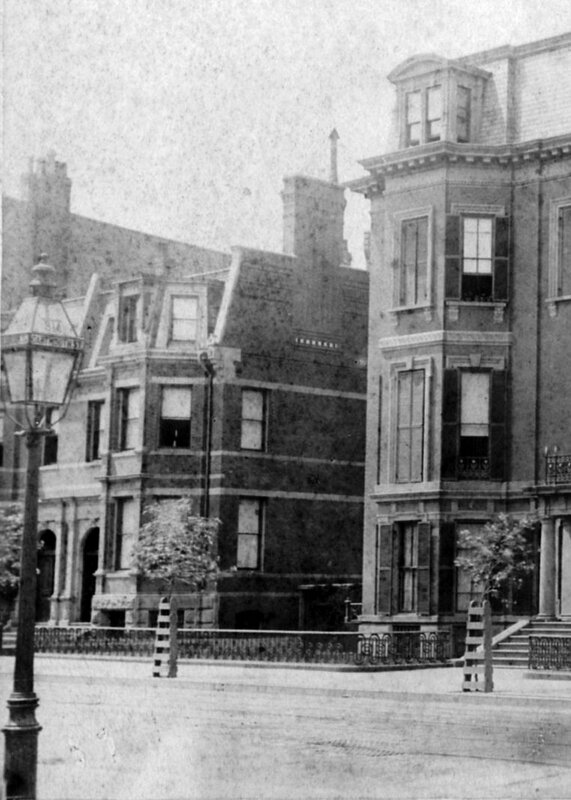 Mary Gordon continued to live at 167 Marlborough during the 1893-1894 winter season, but was living elsewhere during the next two seasons, when it was the home of Mr. and Mrs. Henry A. Rhodes, probably Henry Allen Rhodes, an accountant, and his wife, Abby E. (Barker) Rhodes. Their usual residence was in West Roxbury. By the 1896-1897 season, the Rhodeses had moved and 167 Marlborough once again was Mary Gordon’s home. By 1910, Mary Gordon had been joined by her granddaughter, Jessie Gordon Sherman, the daughter of Gardiner Sherman and Jessie (Gordon) Sherman. Her mother had died in July of 1884, a few days after Jessie Sherman’s birth, and her father had died in January of 1907. Also living with Mary Gordon from about 1910 was Mabel Josephine (Tilton) Wilson, the widow of Ward Farrar Wilson. He had been a reporter with the Boston Globe; they had married in October of 1900 and he had died in December of 1904 in Redlands, California, a victim of tuberculosis. Mabel Wilson was a friend of Miss Sherman. Mary Gordon died in August of 1911. 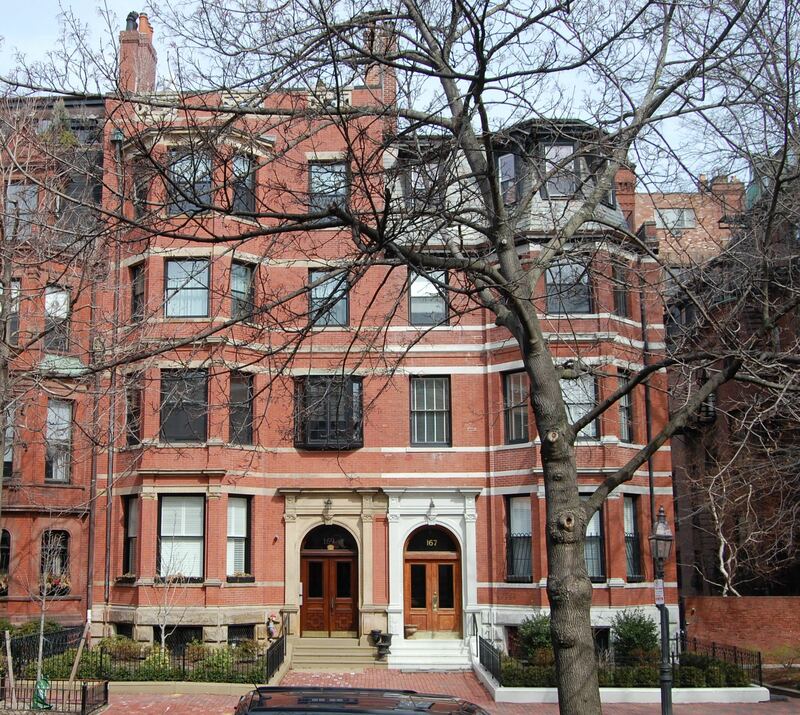 In her will, she left 167 Marlborough in trust for the benefit of Jessie Gordon Sherman. Jessie Sherman and Mabel Wilson continued to live at 167 Marlborough during the 1911-1912 winter season, but were living elsewhere for the next five seasons, probably traveling abroad together. During the 1912-1913 winter season, 167 Marlborough was the home of Sarah Moody (Cushing) Toppan, the widow of attorney Robert Noxon Toppan, and her sister, Fannie E. Cushing. They previously had lived in Cambridge. By the 1913-1914 season, they had moved to 170 Marlborough. By the 1913-1914 winter season, 167 Marlborough was the home of William Bennett Munro and his wife, Caroline S. (Gorton) Munro. He was a political scientist and historian, author, and professor of municipal government at Harvard. They continued to live there during the 1916-1917 winter season, but moved soon thereafter to the Hotel Somerset. By 1920, they were living at 229 Marlborough. By the 1917-1918 winter season, Jessie Sherman and Mabel Wilson were living at 167 Marlborough once again. They continued to live there until about 1920. In January of 1920, at the time of the US Census, they were living in Redlands, California (where Mabel Wilson’s husband had died in 1904). During the 1920-1921 winter season, 167 Marlborough was the home of Miss Florence R. McLean. 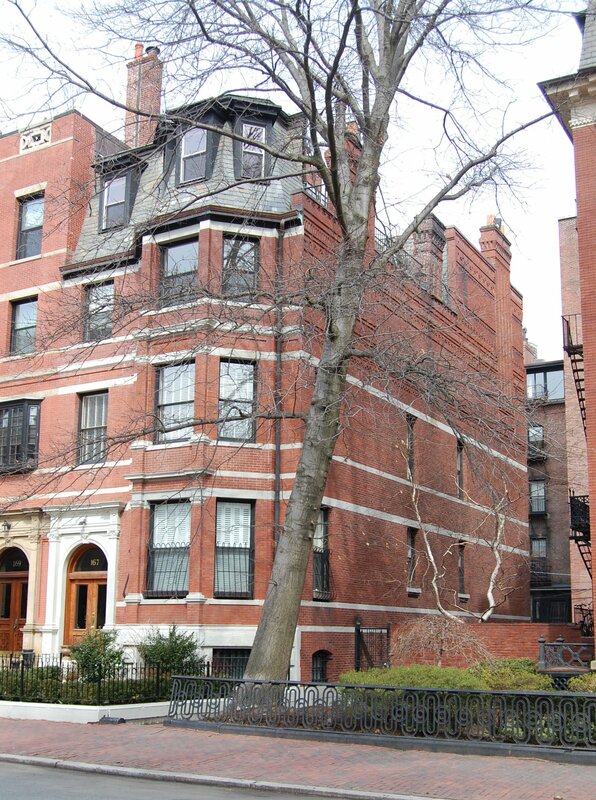 During the 1921-1922 winter season, it was the Boston home of Herbert Frederick French and his wife, Edith (MacGregor) French. In 1920, they had lived at 353 Beacon. Their primary residence was in Randolph. Herbert French was a certified public accountant, specializing in the shoe and leather business. He also was president of the Randolph Savings Bank. The Frenches had moved to 110 Marlborough by the 1922-1923 season. By the 1922-1923 winter season, 167 Marlborough was the home of leather and wool merchant Eugene Rosenthal and his wife, Sadie (Rosenbaum) Rosenthal. They previously had lived at the Copley Plaza Hotel. They also maintained a home in Beverly. In September of 1927, the Rosenthals purchased 148 Commonwealth, where they moved in late 1928 (the house had been under a lease to George and Lucile Swift which expired on August 31, 1928). On June 20, 1928, 167 Marlborough was acquired from Jessie Sherman’s trust by Eliza Tileston (Hemenway) Cabot, the wife of real estate dealer George Edward Cabot. They owned and lived at 169 Marlborough. In January of 1929, George Cabot applied for (and subsequently received) permission to expand the third floor by replacing the mansard roof in the front and to build out a small existing structure on the roof towards the rear to provide servants’ rooms, resulting in a partial fourth floor in the rear 40 percent of the house. The remodeling was designed by architects Bigelow, Wadsworth, Hubbard and Smith. Plans for the remodeling are included in the City of Boston Blueprints Collection in the Boston Public Library’s Arts Department (reference BIN P-58). The Cabots continued to live at 169 Marlborough and leased 167 Marlborough to others. By the 1929-1930 winter season, 167 Marlborough was the home of George Swinnerton Parker and his wife, Grace Eliza (Mann) Parker. They continued to live there in 1932. The house was not listed in the 1933 Blue Book. By the 1933-1934 winter season, 167 Marlborough was the home of Gordon Abbott, Jr., and his wife, Esther Lowell (Cunningham) Abbott. 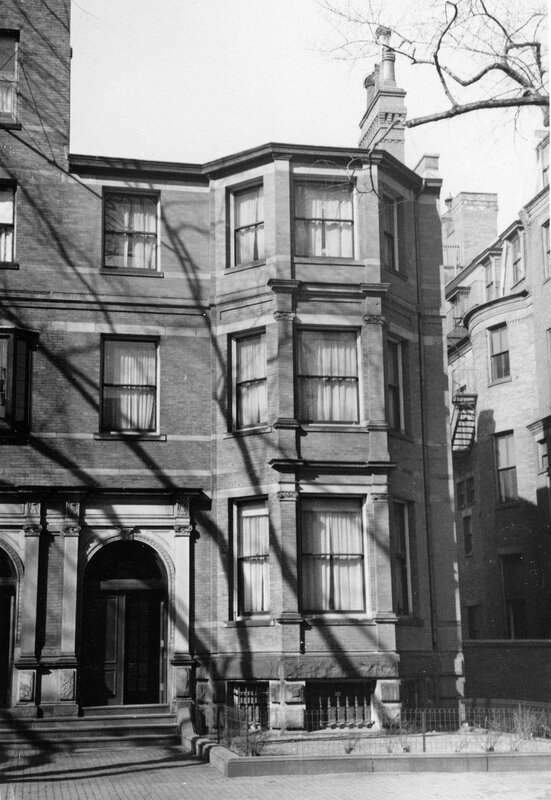 They previously had lived in Brookline, and during the 1929-1930 winter season, they had lived at 13 Gloucester. They also maintained a home in West Manchester. Gordon Abbott was a banker and, after serving in the Navy during World War II, owned the Manchester Marine Boatyard. The Abbotts continued to live at 167 Marlborough until 1939, when they made their home in West Manchester their year-round residence. 167 Marlborough is shown as vacant in the 1940 Boston City Directory. By 1941, it was the home of Amelia (Amy) Chapman (Thorp) Knowles, the widow of banker Robert Winthrop Knowles and the granddaughter of Henry Wadsworth Longfellow. She previously had lived at 189 Marlborough. She also maintained a home in Beverly Farms. She continued to live at 167 Marlborough until about 1947. Ellen Cabot had died in November of 1944 and George Cabot had died in April of 1946, and on September 5, 1947, 167 Marlborough and 169 Marlborough were acquired from Eliza Cabot’s estate by Glenwood J. Sherrard and Margaret S. Henderson, trustees of the 236 Beacon Street Trust. Glenwood Sherrard was the proprietor of the Parker House hotel, and Margaret Henderson was the wife of real estate dealer Elliott Henderson. On December 24, 1947, 167 Marlborough was acquired from Glenwood Sherrard and Margaret Henderson by Miss Helen Aspinwall Smith. She previously lived in an apartment at 199 Marlborough. Helen Smith married in July of 1950 to Herbert Patten Chadbourne. 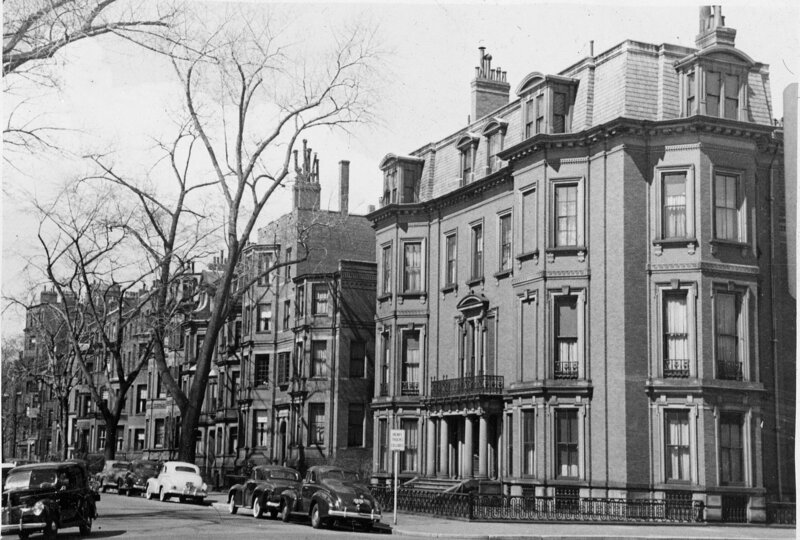 After their marriage, they lived at 167 Marlborough until about 1951. On January 15, 1952, 167 Marlborough was purchased from Helen Chadbourne by Samuel Wasserman and his wife, Ella Frances (Brennan) Wasserman. They previously had lived at 321 Marlborough. In February of 1952, he applied for (and subsequently received) permission to convert 167 Marlborough from a single-family dwelling into seven apartments. On May 28, 1952, they transferred the property into Ella Wasserman’s name. They continued to live in one of the apartments at 167 Marlborough until about 1961. On August 15, 1961, 167 Marlborough was acquired from Ella Frances Wasserman by Jennie Ambrose (Tripp) Stevenson, the wife of John Stevenson. They lived in one of the apartments. They previously had lived at 110 Marlborough. On October 30, 1977, Jennie Stevenson transferred the property to her husband. They subsequently moved to Cambridge, Minnesota, where she died in February of 1978. 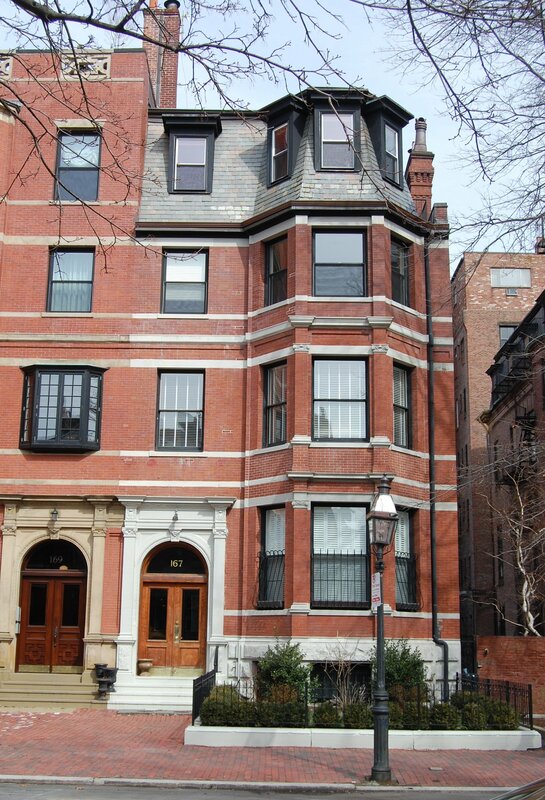 On December 1, 1978, 167 Marlborough was purchased from John Stevenson by Harvey P. Wilk and Jerald R. Feldman, trustees of the 167 Marlborough Street Trust. On January 29, 1980, 167 Marlborough was purchased from Harvey Wilk and Jerald Feldman by Joseph P. Segar, trustee of the Tiberon Realty Trust. In April of 1980, the Tiberon Realty Trust applied for (and subsequently received) permission to convert the property from seven apartments into four apartments. In August of 1980, it applied for (and subsequently received) permission to legalize the occupancy as five units. Also in August of 1980, it applied for (and subsequently received) permission to add a fourth story in the front and center of the house, connecting with the existing partial story in the rear, with a new mansard roof in the front. In February of 1981, the Tiberon Realty Trust applied for (and subsequently received) permission to construct a 12 foot by 12 foot addition at the rear for a dining room and to construct several decks. On April 2, 2018, the Tiberon Realty Trust amended the master condominium deed to reduce the number of units from five to four, reflecting the combining of Units 1 and 2, both duplex units located on the basement and first floors.